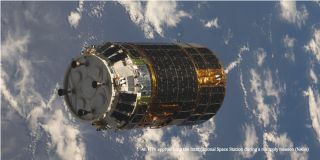 An HTV approaching the International Space Station during a resupply mission. An experimental space junk "collector" has glitched during its first orbital test. The system, designed by the Japanese space agency (JAXA) and a fishing net company, should have unfurled a 700-meter (2,300 ft) tether from a space station resupply vehicle that was returning to Earth. According to JAXA scientists, however, the system appears to have faltered. Space junk is a growing problem in low-Earth orbit. Since the beginning of the space age, debris as small as flecks of paint and as large as whole satellites and parts of rocket boosters have been accumulating and it is estimated that over 100 million individual pieces of junk (tens of thousands of pieces that are over 10 centimeters in size) are whizzing around our planet. Although space is big, and the likelihood of an astronaut and/or spacecraft being hit at any one time by a piece of debris is currently low, concerns are growing that we are reaching a critical point where, in the future, collisions with space junk could become so common that it might prevent us from launching anything into space. Lives may not have been lost through a space junk collision (yet), but satellites have been hit and small pieces travelling many times faster than a bullet on Earth have smashed into the space station's solar panels. On numerous occasions during its 16 years of operation has the outpost had to modify its orbit about Earth to avoid debris being tracked by ground-based radar. So, in an effort to counter this growing threat, JAXA hoped to test a electrodynamic tether that is attached to the H-II Transfer Vehicle (HTV) — called "Kounotori-6." The Kounotori Integrated Tether Experiments (KITE) aim is to test the technology behind propelling the cable into space. Once deployed, a fully operational space junk mitigation system incorporating KITE would send the tether out to large pieces of debris, grab onto them and the spacecraft would then pull them down to Earth to be incinerated by our atmosphere. The robotic cargo space vehicle arrived at the International Space Station in December and, after unloading supplies and experiments for the crew, it was reloaded with trash from the orbiting outpost. The vehicle was released from the space station on Friday (Jan. 27) and and is expected to burn up safely in the Earth's upper atmosphere in early February. But before its fiery reentry, the HTV was supposed to extend the tether to see if the space junk removal technique is at least feasible. Alas, it would appear the stainless steel and aluminum cable didn't even get off the starting blocks and wasn't released from the resupply ship. JAXA scientists have said that they will continue to attempt to send commands to the mechanism, but they have very little time left to troubleshoot.